So, as promised I said I'd blog the evening portion of Plus North. Let me get one thing out of the way, due to a miscommunication with the hotel sadly some elements of the evening i.e. the food and bar, were, well, a bit crappy and trust me no one was more disappointed and annoyed than Toni and I. But, what we did have was a fantastic live performance from the lovely Rosie O'Sullivan, a bodacious catwalk full of my favourite babes, and a ridiculous crazy dance/karaoke marathon. Every single guest, despite the bar/food hiccup made the night one of the funniest I've had in a very long while and for that, I thank every single one of you. I had the honour of walking the exclusive Scarlett and Jo Catwalk in a complete stunner of a dress, that everyone kept oohing and ahhing over! 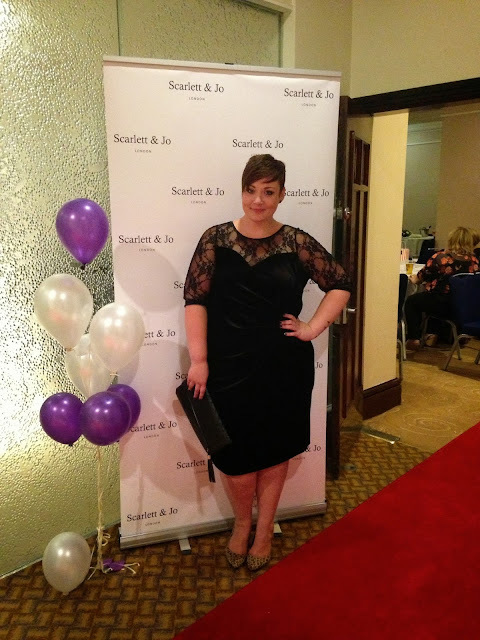 After my little turn on the catwalk, I did a quick change onto my party outfit, sadly it wasn't what I had planned due to some sizing issues so the lovely guys at Scarlett and Jo came to my rescue and loaned me a shorter version similar to the dress I'd modelled.. Both are a sumptuous stretch velvet which came in handy when I was having my mad dancing session believe me!! The dresses are, as we've come to expect from Scarlett & Jo exceptional quality, well made and cut wonderfully and should be available on the Evans site in the next month or so. The owner of Coppernob the firm that created Scarlett & Jo always comments on how I'm casual MrsBeBe and never get dressed up, so here you Gifi, I hope I did you proud my love!! The night despite its hiccup was fantastic, a huge thank you to Scarlett & Jo, our gorgeous models, the super talented Rosie O'Sullivan and our fab DJ Mike who was such a laugh and kept the party rocking! !